I am the lead cow. Herd dynamics are an interesting thing. You usually have a lead cow, the one that will come up when the dinner call goes out and be first into the feed, pushing all the others out of the way. I've messed with my dynamic a bit, mostly through necessity as I move cows around to make sure they all get enough feed and I get enough milk. I have all the cows back in the main paddock at the moment and was hoping to get a bit of a routine back. However when I was traipsing round the lantana the other day I realised something. I am the bloody lead cow! Even when I go down with no food, they won't come up until I get to them and head back up the hill. 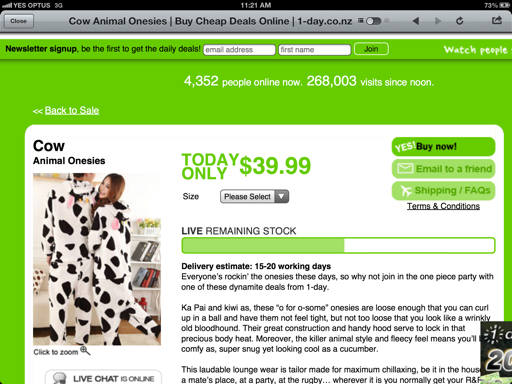 Maybe I need a cow onsie to be a bit more convincing. I also don't headbutt Laf off the bucket of pollard, so maybe I just don't command the respect to be a proper lead cow. I should be writing about crowdfunding and fruit orchards but I had this awesome dinner. I have less than a day of the great crowd funding experiment to go and I should be trying to pimp it out for just one more fruit tree but last night I pulled out the Bang Up Cookbook, turned to the chapter marked Go On, Have a Go and cooked up a tasty tasty treat. So I'm going to write about that instead, because it is worth me putting down, even if I have no chance of getting the same dish out of the Lantanaland kitchen again. In the fridge we had, pumpkin, ginger, garlic, baby spinach leaves and some pork belly cut up into chunks. I decided that it would taste nice with some coconut cream. (I cooked half the meal before discovering that I had run out of coconut cream and had to get the wife to stop on the way home, defeating the purpose of the bang up meal). I cut the pumpkin into chunks and left it in the oven slow roasting with a generous cover of cayenne pepper. Into the mini food processor, (no fancy thermomix for me, $20 from the Good Guys) went 3 cloves of garlic, big knob of fresh ginger, some fresh turmeric my mum left me, 6 or so chillies off the bush, few big tablespoons of crunchy peanut butter, juice of a lemon, dash of apple cider vinegar and zzzzzzzzzzzzz. The pork belly got thrown into this mix to marinate while I prepped the mashed potatoes. Maybe not the appropriate starch for this meal, but my love of mashed spud could probably be phycoanalysed for weeks. The marinated pork chunks went into a hot pan, the edges crisped up before the rest of the marinade went in to be cooked off a little. Once the coconut cream was added, the heat was dropped down to very low and the roughly chopped spinach, slow roasted pumpkin and kernels off one cob of corn were added. Potatoes were mashed, pork was served and demolished. I'd love to be able to show you a picture, but that would have meant stopping the eating and that was not an option entertained. Anyway, less than a day before the Pozible campaign ends, so if you'd like to get the orchard one more fruit tree, have a look. Who knows, I might even cook you Bang Up Coconut Cream Pork as a thank you. 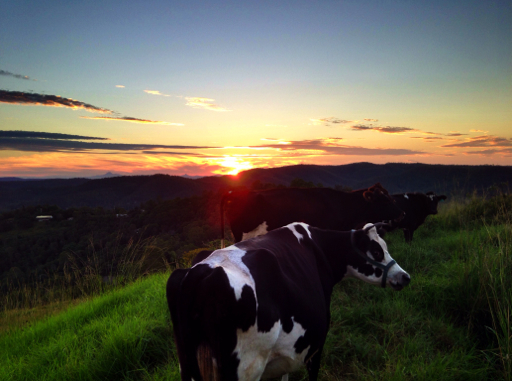 Crowdfunding update, chook house architects, chopping trees and planning. The planning for the orchard has begun well and truly. One of the biggest jobs was clearing the dead and goat damaged trees from the plot. There is something about using a chainsaw that can get even the nerdiest, mild mannered mans testosterone going. I don't know what it is, but I chopped down a tree the other day, went upstairs and put my bluey on and sculled a VB. Actually that didn't happen. It would take a much stronger chemical than testosterone to get me to drink a VB. While I was chopping down one of the trees I had a great idea for a chook house. Chooks go great in an orchard, cleaning up fallen fruit to prevent fruit fly, keeping down the grass, doing a bit of free fertilising. One of the fences keeping them in will be the grape trellis and there house will be like this. Forgive my poor artist impression. 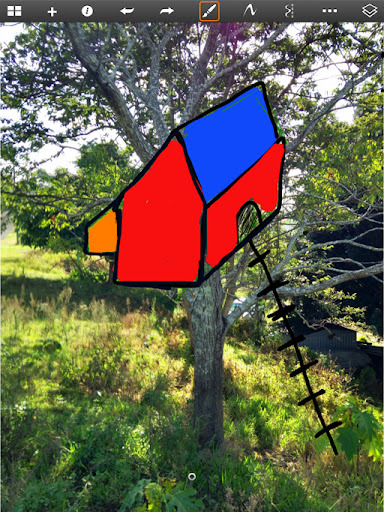 That is a chookhouse that will be built into the tree. Up off the ground to give a bit of extra protection from dogs and foxes, it will be a nice little feature. Any architects out there that would like to design an award winning chookhouse feel free to leave your contacts in the comments. For those of you outside of the Gold Coast or too lazy to get up, here is the radio interview I did with ABC Gold Coast breakfast. Crowd funding the orchard, a new way of planning and more thanks than I can articulate. Less than a week ago I got fired up about getting Lantanaland's orchard up and running after seeing a fantastic mature kiwi fruit trellis up the top of Mt Tambourine. I jokingly suggested that I should get a Kickstarter going. (For those who don't know what Kickstarter is, it is a way of funding tech or arts projects in the US. Sometimes you get something back, an album or the designed object, but mostly you do it to support the idea or innovation.) Twitter buddy @lukebunyip suggested that I should try Pozible, the oz equivalent. At first I felt a little hesitant to ask people to help out but that is the brilliance of crowd funding, you only help if you want to. It turns out the thought of Lantanaland having a full orchard up and running was something people were willing to support. I set a target I thought was realistic in 30 days, $700. That would allow me to plant out about half the orchard and put in drip irrigation, to ensure the best chance of good growth and survival. To my complete surprise, delight and eternal gratitude, I have reached that in three days. Any extra sponsors from here on in are just extra trees that I can plant. I cannot thank the people that chipped in enough and your names will be part of Lantanaland history forever, deeply carved into the wood of the kiwi fruit trellis entrance. It does raise a situation I have never encountered before though. Lantanaland has always grown in drips and drabs and hard work. The biggest single day was the fence lines hard cut out of the lantana when we first got the cows. The orchard though, can be planned as one full project. I can plot out where to put trees and access points and think about how to walk through it, how the chooks will be housed in it to keep down weeds and pests, where to put the entrances. Once it is all planned then I get stuck in. I will be planting in old car tires to raise it up off the hard clay soil, so i'll move them around until I find a nice pattern. The orchard will be on the steep hill behind the house. It is a weedy pain at the moment. Too steep and rough to mow it is fenced off with electric and the cow gets chucked in there every now and then to keep the grass down. The first thing I will do is slash the weeds down and arrange the tires where I think will be good spots, considering sunlight and canopy size. Once I'm happy with that I will lay out some drip irrigation. With a heap of trees to keep happy I want to make sure that they are all getting adequate water, especially with a summer like the one we just had, with two months of very hot dry weather. Then I will dig all the holes and mulch around the tires so that I can plant all the trees in one day. Next job will to build the grape and kiwi fruit trellis. The kiwi fruit trellis will double as the entrance to the orchard and a monument to all my sponsors, so it will be big and strong, something to last forever. I'm thinking that the grape vine will run along the boundary line and double as a fence to keep the chooks in as I hope to fully fence the orchard so that I can run chooks or ducks in there as orchard staff, fertilising and doing pest control. Once all the infrastructure is in, I can order the plants! The rough list I have sketched out is macadamia,plum (gulfgold), muscadine grapes, pine nut, grumichama black and red, kiwifruit, lychee, mango bowen or r2e2, pear, nashi, apple tropic and dorsett, olive, peach florda plus maybe another lemon and lime. Growing up on a farm. With promite sandwiches. There are definitely positives and negatives for a young boy growing up on a farm. The flip side of all this space to grow into is that there are always jobs to do. The cow hadn't come up for a few days. I don't worry too much because she usually has the calf on her, but I needed milk. So into the backpack The Boy went and we went looking. Gourmet dinners and playing would have to wait. Dolores calf had wandered off with Laf, who is outside my place on the 100 acres next door with its lush kikuyu grass. That meant Dolores was really full as I hadn't milked her this morning. She needed to be milked, while mastitis is much less of an issue for me as I hand milk with a stripping action, it is not good for her to sit there all night with really full udders. And if I don't take the milk her production will drop and Laf isn't even pregnant yet. The last thing I need is my cow drying off. That meant The Boy got a promite sandwich for dinner and a ride down to the milking bales. He sat next to me in the backpack and quite happily ate and looked at the chooks, who were cleaning up the pollard crumbs Dolores was dropping. I finished up, released Dolores from the head crush and moved her bucket into her night pen. As she backed out she spotted a promite smeared face and it must have smelled good because she started to lick The Boy clean. He wasn't fazed until I yelled to shoo the cow off which is when he decided that it was all a bit much and he'd like a cuddle please. Not many kids would come home, walk down a hill and lead a cow back on a leash, then watch their dad hand milk and have the cow clean up their dinner with her tongue! 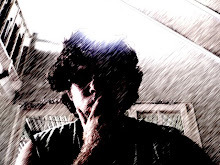 Seeing the future in the present. Fruit tree edition. Sometimes you need to see what something might become to get inspiration to keep going. Fruit trees take time to show the reward and for someone like me, who knows bugger all about gardening, there are many pitfalls and problems that can occur to get in the way. But you plant and do your best because once they are established they are a gold mine, especially for a keen cook. It is why I recently recommended to a twitter mate to add value of potential tree change properties that contains a decent orchard. You can spend a lot of money on fruit waiting for those trees to become bearing. Today though, I got a glimpse into the future of what may be. On a small day trip up to Mt Tambourine, ironically to try and buy some cheap fruit trees, we pulled over down the road from the school and waited for The Boy to wake up. 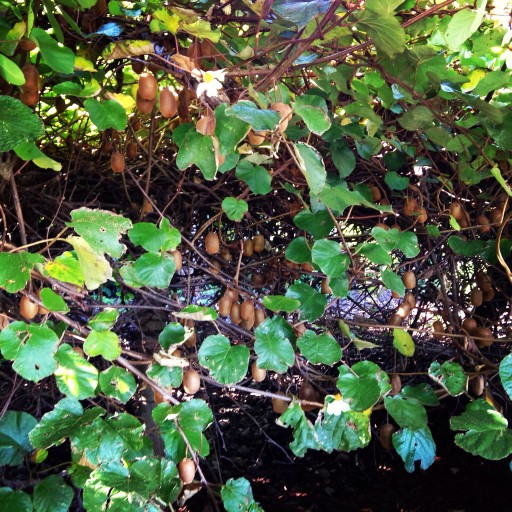 I got out for a wander and in the property we had parked next to there was this amazing trellised kiwi fruit. The whole orchard was maybe 50m long and 20m wide and had maybe 30 trees in it, but there would have been thousands of kiwi fruit there. The vines themselves looked amazing, thick bristling canes weaving amongst the wires of the trellis. 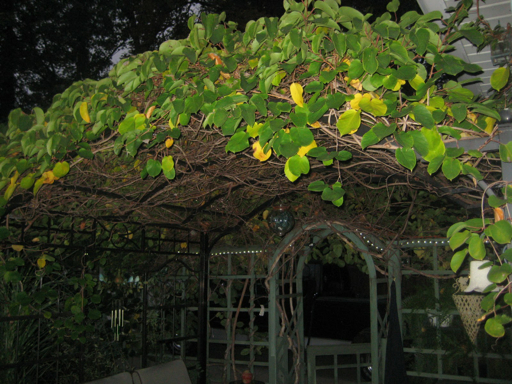 I immediately could see what a garden entrance to the orchard would look like with big thick beams holding up kiwi fruit vines, enticing you into a world of fruit. It got me thinking about the orchard and what it needs, in terms of fruit that I will use or do use. I probably could do with two more lemons, but one mandarine, grapefruit and orange should be enough. I am trying to sprout every avocado seed that I get, as we go through lots of them and would eat more if we had them growing. I am going to get a pine nut tree for sure, we use lots and lots of them. More pears, The Boy has gone through more pears than I can count in his short life. Bananas we have in boom and bust cycles. One fruit that has caught my eye is the Grumichama. It is supposed to be the sub tropical version of the cherry. Ever since eating off the cherry trees in Tasmania I have been longing for them. It is definitely worth a punt. Apples of course need to go in. Those are probably the main ones. Maybe I should start a kick starter style project, buy a fruit tree and get a box of seasonal fruit a month once the orchard is going. Damn, I forgot grapes, gotta have them as well....hmm I'm off to research and dream of mature fruit trees and a productive orchard.